Online shoppers can now appraise & interact with retail products from all angles. Our 360° interactive object tours are an appealing & cost effective alternative to ordinary 2-dimensional photographs, and they are fun to interact with ! Because they are more appealing than 2-D flat images, our virtual tours can boost real-world traffic, drive sales, increase repeat online visitors and set you apart from the competition. We produce a range of virtual tours to meet the marketing goals and budget of our clients. 360promo can help you to use the latest in immersive imaging technologies on your WebSite, kiosk or digital business card. Capitalize on this rapidly growing online activity by offering the most effective visual content available. 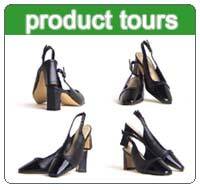 Our unique 360 retail product & object tours are produced under professional studio lighting and conditions. For fast tour production, products, clothing & objects can be shipped to our Australian studio, or we can setup our portable studio on-site anywhere in the world. Java powered tours load within seconds. Help if the above tour doesn't appear. Rotation and zooming via mouse or keyboard. All content, graphics & code Copyright © 2002 - 2007 Craig Dunning & 360promo.com. All rights reserved. No republication, caching or copying permitted without prior written permission. Best viewed at 800 x 600 resolution or higher using 16K+ colours.